Teachers and Teacher Unions in a Globalised World asks a series of pressing questions of teacher educators, teachers and teacher unions worldwide in this era of global capitalism. As governments around the world support austerity politics in the face of financial meltdowns, social inequalities, terrorist threats, climate catastrophe, wars and mass migrations, the book questions whether practitioners in teaching and teacher education are succumbing to pressures to dismantle their nation-state systems of education. The authors present a clearly argued case in Ireland for teachers and teacher educators organising to realise their moral and social responsibilities of free and fair schooling for all when it is most needed, as well as insisting on policy debates about a free publicly funded school system. 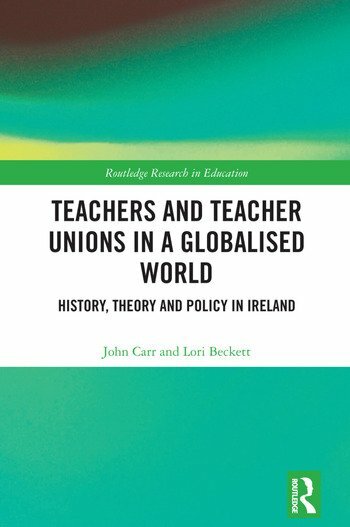 At a time when teachers are feeling overwhelmed with workload and frustrated by the visible turning of events away from the historical record, the book emphasises the importance of practitioner research in informing decisions about a strategic and democratic way forward for education around the globe. Teachers and Teacher Unions in a Globalised World will be of great interest to academics and researchers in the field of education, as well as teacher educators, practitioners and policymakers. Lori Beckett, PhD was the inaugural Winifred Mercier Professor of Teacher Education at Leeds Metropolitan University, now retired, and works with the Vere Foster Trust. John Carr, MA (Ed) is the immediate past General Secretary of the Irish National Teachers Organisation (INTO), now retired, and chairs the Vere Foster Trust.